In the history of MV Agusta, this model was built in greater numbers than any other, with some 45,000 produced. Presented at the salon in Brussels in January 1953, the remarkable Pullman was well received despite the questionable aesthetics. It was succeeded by the SuperPullman of 1956 which had a pressed metal frame. 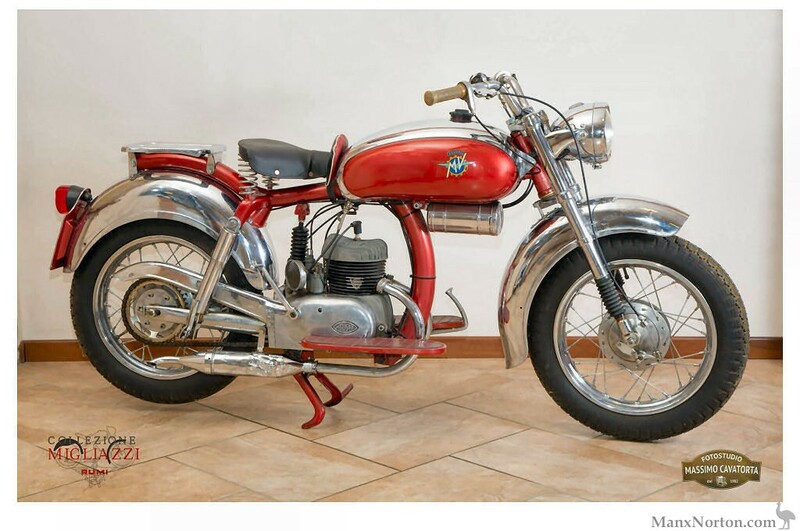 A new version was on test for 1957 but the whole motorcycle industry was in disarray after the release of the Fiat 500 and the project was scrapped. Colour: Red and Cream or Duckegg Blue. Suspension Front: Conventional telescopic forks. Suspension Rear: Series one had a single central mechanical suspension unit and two hydraulic. Series two had two hydraulic shock absorbers.